At the recent 50th Anniversary reunion of those committed to preserving the memory of Igor Dyatlov and the Ski Team that perished in 1959, the work of the Aquiziam team was noted and appreciated. 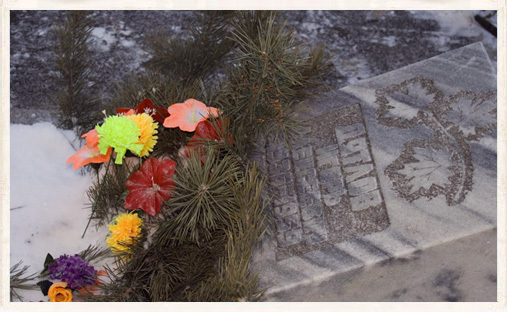 One of the gravestones with flowers laid at the reunion of those involved in the Dyatlov Pass mystery – February 2009 . (C) Vladimir B. We would like to express our thanks to Dr. J. Kuntsevich. for his letter of commendation. The Aquiziam team genuinely try and approach our interests from a scientific point of view and make every effort to check and verify the information that we display on this website. It is gratifying when that effort is appreciated. The contact details on the letter below have been removed until we receive approval to display them. 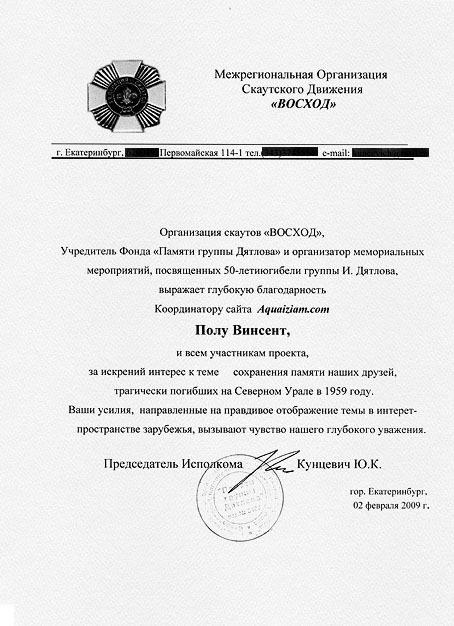 the Founder of the Foundation for the Remembrance of the Dyatlov Team and the Organiser of the Memorial actions devoted to the 50th Anniversary of the demise of the Dyatlov team, expresses profound gratitude to the coordinator of the website Aquiziam.com and to all participants of the project, for their interest in this theme and the preservation of the memory of our friends, tragically victims on the Northern Urals in 1959. Your efforts directed to the truthful display of this event on the internet in foreign countries has earned our deep respect. The Memorial Monument to the unfortunate Dyatlov Pass ski team. (C) Vladimir B.